The other day someone asked me what I did for a living. This person didn’t know me very well, but still wasn’t really willing to let it go when I said I was in the hospitality industry. I find that when I meet someone unfamiliar with the hotel business, they want specific examples of how I spend my days. Huh. Well, that’s a tough one, since no two days are ever the same. Working in a management and consulting company, I wear many hats every day. My husband compares consulting to someone who looks at your watch and then tells you what time it is. Maybe true, sometimes. But I prefer to think of it as coaching and helping, just one of the facets of our business. We work with hotel owners and managers to help them optimize their businesses and run efficiently. If done correctly, we improve performance, work ourselves out of a job, and hand the reins back to the owner. Our green certification program, Fresh Air Lodging, is what takes up most of my time. Since the majority of my work takes place online, my daughter thinks I have the best job ever, updating statuses and tweeting all day. That’s not really what I’m doing, but I admit I egg her on a little for my own amusement. As the person in charge of marketing and social media, I do a ton of surfing and even more reading. Offline I work on creating presentations and promotional pieces. I assure you, by the end of the day, I cannot wait to turn off my computer! The part of my job that I like the most is the writing. Being the right brain of our business, I get a lot of opportunities to be creative in writing articles and posts. It has even led to some freelance jobs on the side. I never used to think there was a place in my ‘work life’ for writing, but this has been a welcome expansion. I even competed in National Novel Writing Month last November, winning the challenge of writing over 50,000 words in less than thirty days. It was a wonderful caffeine-fueled, sleep-deprived experience that I cannot wait to repeat if my workload allows. All in all, I still don’t quite know what to say when someone asks what I do for a living. Consulting? Green certification and social media? Writing? Maybe I’ll just stick to hospitality. 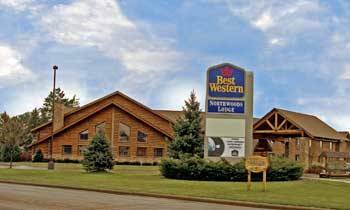 This week we had the opportunity to meet with a group of colleagues from Best Western–you know, the world’s largest hotel chain. Anyway, we were invited to attend a co-op meeting of Minnesota and Wisconsin hotel owners and general managers and give a little schpeel about our business. It was really great for us, because we have worked for many years with a lot of these folks and it was nice to see them. But what else was good is the way they work together. The group is made up of various ages and skill sets, some operators and some corporate folks. What struck me as impressive was the partnering that was taking place. Even though they were often competing for the same customers, these people were willing to come together and share their knowledge. Gone were the days of secrecy and unwillingness to express ideas for fear that someone else will copy you and steal your business! These people were discussing what they’d learned in their decades of experience in order to try to prevent others from repeating their mistakes. So that’s the lesson I came home with; work together. It doesn’t matter if you’re a corporate-type or a more relaxed, leisure-type business, we are all on the same page. Jumping in and partnering with other people can help you both by expanding your marketing reach. Sharing of best practices aids newer members of your company. And since we all have the same 24 hours in a day, you can get more done by creating partnerships and working with people rather than against them. 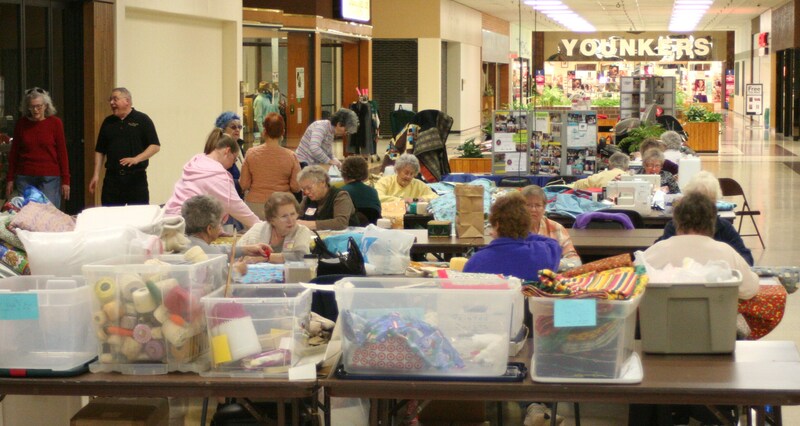 Each year in March a group of people gather in the middle of the mall in Superior, Wisconsin for a Quilt-A-Thon. Organized by Home and Community Education (referred to as the Homemakers clubs), women volunteer to come in from neighboring communities to cut, sew, and tie blankets for kids in crisis. To those who see the story on the news, it most likely looks like a morning and afternoon of talking while working on a hobby. But below the surface, a great deal of work has already taken place. 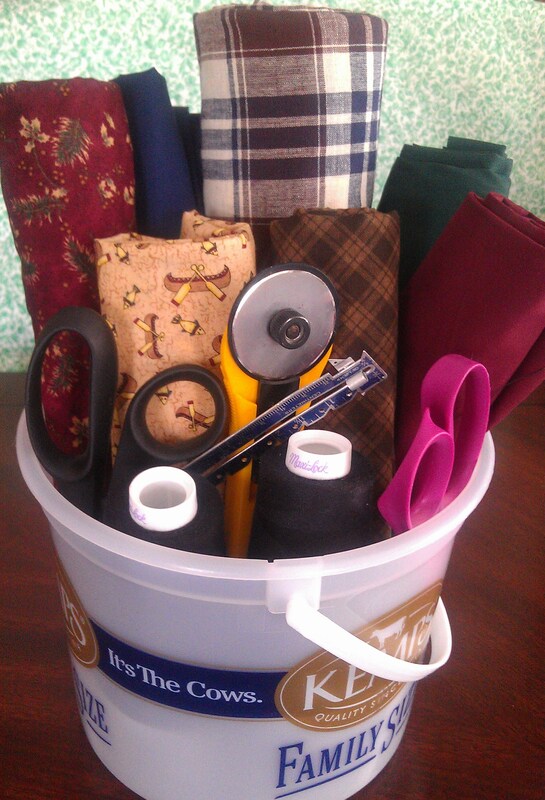 In order to have this event be a success, the Homemakers count on the donations of local businesses to gather enough material, thread, and quilt batting to make over a hundred blankets. Hobby and quilt shops from around the Duluth/Superior area have been extremely generous in the past years with their donations. In addition to the tangible goods, we also rely on people giving freely of their time. We arrive between nine and ten that morning to get everything set up. People come in with sewing machines and quilting notions, ready to work. Some even bring in pieces they’ve been working on at home. In past years we had one workhorse who sewed the majority of the blankets together ahead of time, leaving final stitching and tying to be done on that day. This year, we had a woman in her 80’s bring in thirty beautiful quilts she made at home over the year. The generosity of these women never ceases to amaze me! One comment we received was that something so small as a blanket can make a huge impact on a child who is in the midst of a traumatic time. Absolutely! 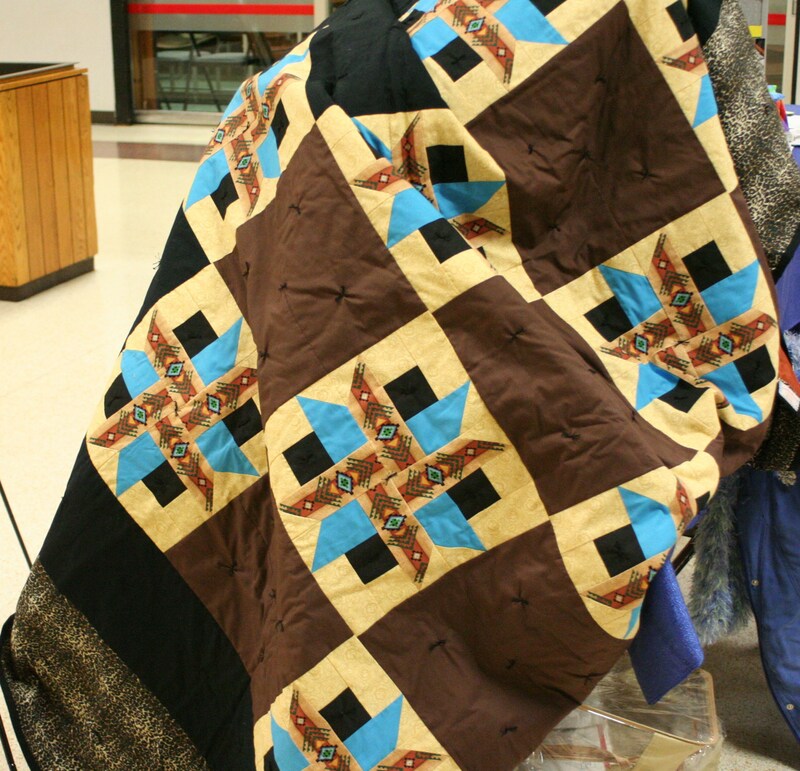 After the 2012 Quilt-A-Thon we were able to distribute 134 blankets. They went to places like shelters, police and fire departments, hospitals, and the Red Cross. Even though we give them thank you cards, I hope that all of the businesses that participate understand how much we sincerely appreciate each piece of fabric we receive. This is a great example of how pulling together a group of partners enables us to make a much larger impact in our community. Spring cleaning, spring fever, spring forward; I wonder what’s on my mind this week! Yep, it’s that time of the year and springing forward tomorrow night will bring a welcome extension to our days. But it also leads to a nesting impulse, the inexplicable need to clean and organize. So I started looking around my pantry, sigh, and could not help notice the leaning tower of ice cream buckets amassed through a long winter. Yes, I’m a borderline hoarder. Yes, we really like ice cream. So what can a person do with all of these family- sized empties? Round up your kitchen items that typically get misplaced. Small items like cookie cutters, rarely used utensils, etc. can be stored nicely in a covered bucket. Store dry goods for your pantry; flour, sugar, even pet food will stay fresher longer if you keep it in a closed container. If you’re crafty you probably have small items like pins, beads, paper scraps, etc. in your stash. What better way to round it all up that an ice cream bucket? You could even make that into a craft by covering your bucket before loading it up! Got kids? Then you probably have toys that are not played with all the time, but you’re not quite ready to part with. Or smaller pieces that can disappear in the bottom of the toy box…can you say Lego?! Do you have a green thumb? Ice cream buckets are a great place to house spare soil, food, or implements for your plants. You could even use them to plant starter seeds; just make sure they have adequate drainage in the bottom. You could use them as a garbage can in the car; line with a plastic grocery bag for easy removal. Pack a travel kit for picnics/drive through meals with napkins, utensils, wipes, etc. Keep your golfer stocked up by having extra balls, tees, and sunscreen in a bucket that they can keep in the trunk for reloading their bag as necessary. In your office, round-up writing utensils and spare desk supplies to stow away in a bucket until you need them, clearing out space in drawers. Got a workshop? These buckets make a great place to store nuts, bolts, and small tools. And they can be quickly labeled with a permanent marker, nothing fancy needed here. 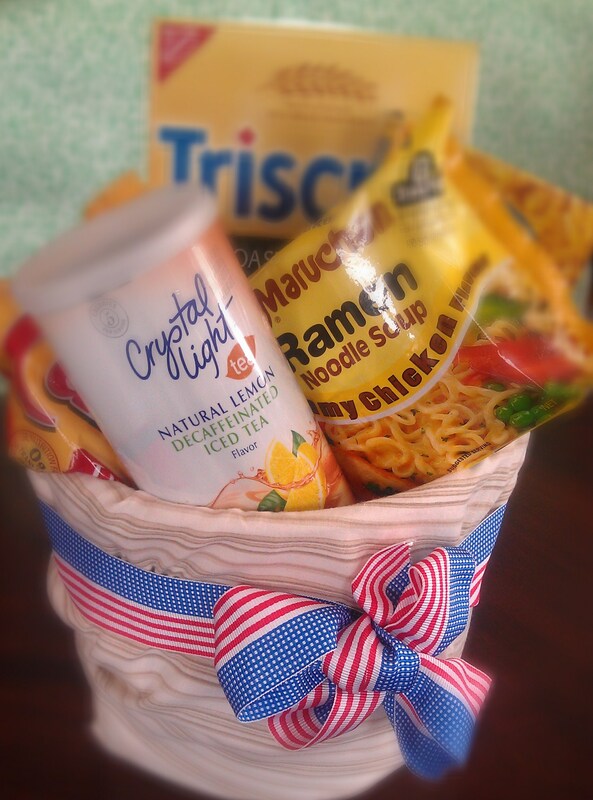 Fill up a care package for gift giving or finals week. 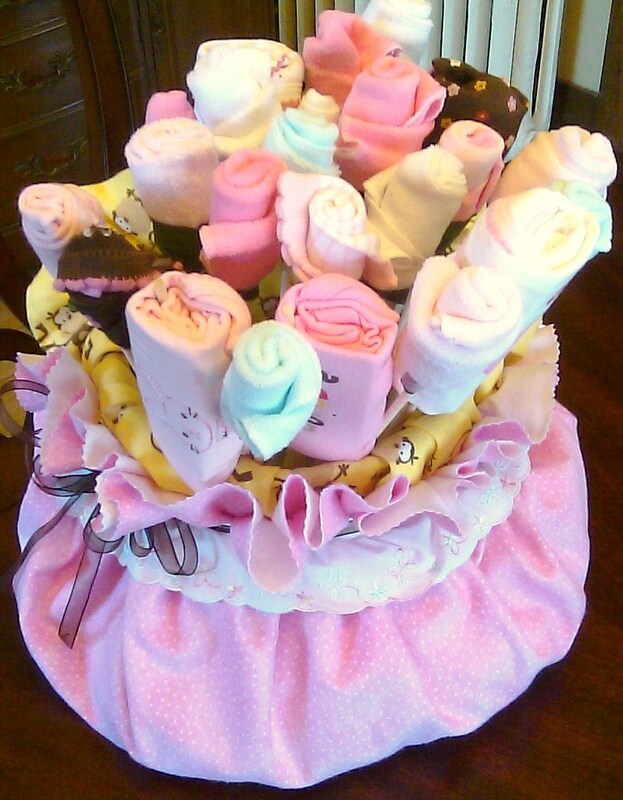 If you can use a scissor you can make one into a gift, no need to buy baskets. There you have it; be creative and eat more ice cream. You’ll need some more buckets now for sure. Wrap pail in a clean pillow case and keep your student happy with treats. 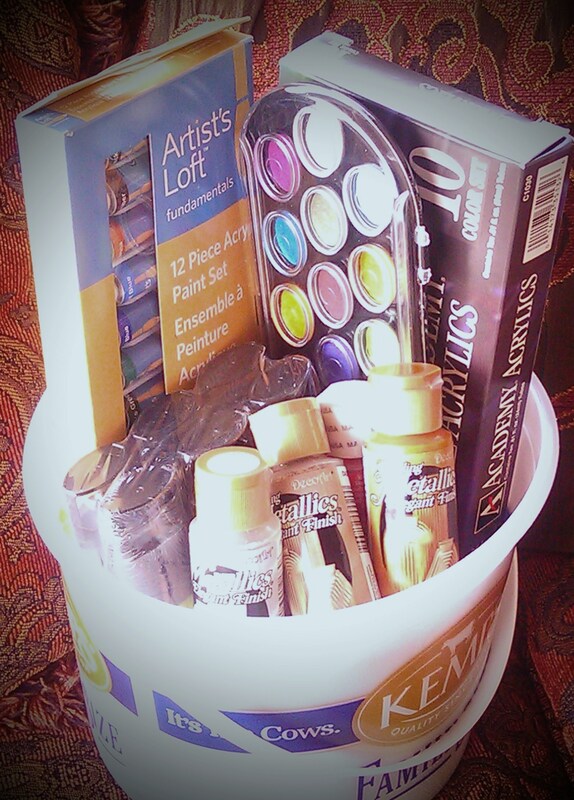 Trying to contain a small portion of the paint we have collected! Matched materials kept together waiting to be quilted. 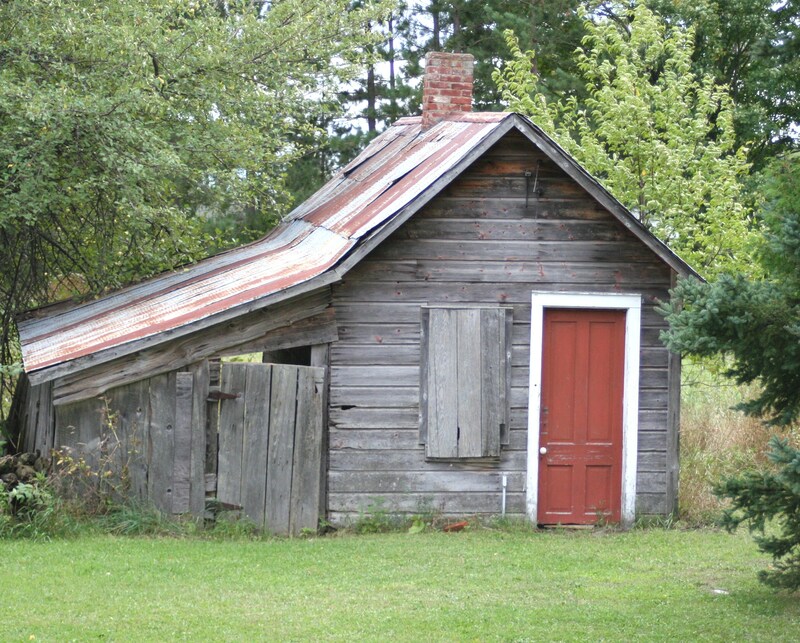 This is a sauna; pronounced like cow—sow-nuh. I grew up in a very Finnish house and we took too many of these to count when I was young. It was a Saturday night thing; you took one whether you needed it or not. This particular model was on my father’s childhood farm. Since there was no tub in the house until the 80’s, this sauna saw a lot of action! In the Upper Peninsula of Michigan where my family is from, it was quite common for people to sit in there until they couldn’t stand the heat any longer and then run outside and jump in the snow. Maybe that sounds crazy, but winters can get long in the U.P. One finds himself doing strange things for amusement up there. This is my mom’s youngest sister and late brother. 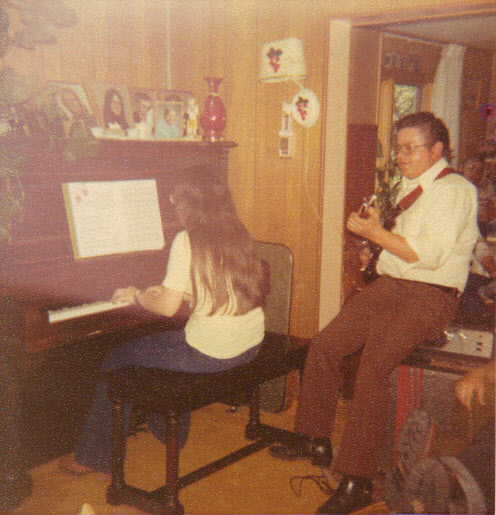 Scenes like this were common at my grandma’s house where this was taken. There was always company coming and going, lots of conversations, and laughter rang through the house. No one would have thought it odd to suddenly hear music coming from the living room. Since there were only a couple of channels that would come in on the TV, we made our own entertainment. Can you imagine your children without technology for one day? I know many who could not function. 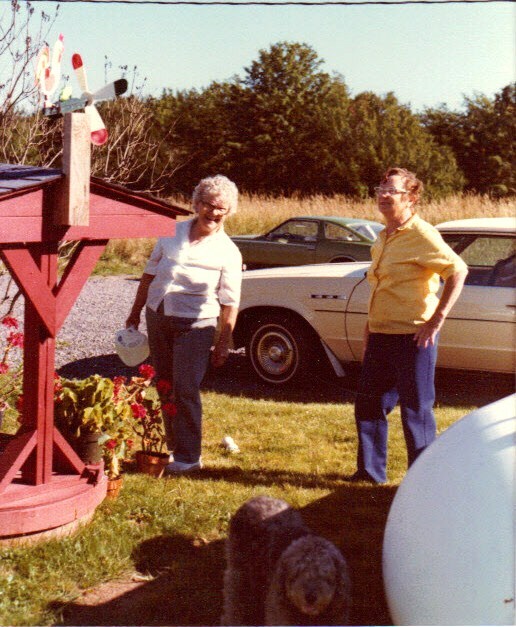 These two women were the center of our family, my grandma, Rauha Sylvia, and her sister, Tyne. They had some serious green thumbs and everything they touched bloomed like crazy. No matter what was going on, they smiled. They fed anyone that came through their door (a trait I seem to have inherited), and never complained about wet or dirty clothes from us grandkids. They were two tiny little women with hearts the size of Texas. I will be forever grateful that I had these influences in my life. So on this day, my birthday, I look back at these Yooper (U.P.) days and smile. I hope that I will be an influence to someone. I hope that someone will remember that I helped/fed/encouraged them when they needed it. I hope that my children and grandchildren will learn to have conversations and be entertained without technology. I hope that through my business I can help others in business reach out and work together. And most of all, I hope that we continue telling stories of the old days and cherish those times.